People often ask where the name Lights-On came from. So, here's the story! Even in his university days Lights-On’s founder, Peter Owen, always intended to set up an IT consultancy and, at that time, planned to call it “OWL Technology Consulting” combining the initial of Owen with the initial of his close university friend’s surname (with an L for Limited!). When it came time to set up the company in 2005 (sadly without the university friend who was happily ensconced in a senior, employed role), any reference to owl seemed already registered at companies house and domain registrars. All variations seemed to be taken despite hours of searching. Owls seemed pretty popular! Sensing Peter’s despondency, his wife came to the rescue with a cup of tea and as Pete sat back sipping tea, his eyes fell upon the photos on his home office wall, some of which were taken way back when he was a budding school age photographer-to-be! The photo shown was taken by Pete when he was only a child. 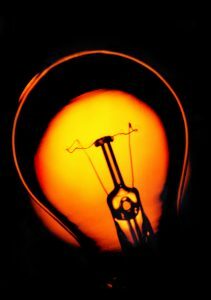 He knew what he wanted – a lit bulb but showing the filament. It was a complex photo to take and he remembered the attention to detail using black hand painted card, some sugar paper and an angle poised lamp aka Blue Peter style! The photo, and the effort to seek the right outcome, caught Pete’s imagination in relation to naming his new company and the lighting theme started to emerge. “Lights out?– perhaps not!”, “Lights on? Keeping the lights on? A guiding light?” It all started to take shape. Pete started googling and Lights On Consulting was available as a company name and as a domain name so Lights-On Consulting was soon registered at companies house and with internet registrars. After many years of managing large IT teams and departments, Pete wanted to work alone and remained as a sole consultant for a number of years but, eventually, opportunity to work with some trusted and capable ex colleagues presented itself and Lights-On started to grow. From the outset, the company was built to scale in terms of documentation and repeatable quality processes but the desire to stay small and work with people of the highest quality has meant slow but steady growth. The team is still a close-knit, small team today with 6 consultants and 2 part-time outsourced, administrative support staff who are equally part of the team. Like many of the consultants, the founder of Lights-On was an IT Director both in and outside of legal. As such, whilst strategy was key, it is only aspirational unless there is a practical plan to communicate and implement the strategy. As such we look for both strategic and practical abilities in all our people and “strategic advice, practically delivered” has become something of a mantle for Lights-On. As a result of this blend of both strategic thinking and practical delivery, our client base has grown, predominantly from recommendation and referral, and today we have helped over 100 clients ranging from the police, through professional services, to sectors as diverse as the food sector. We specialise in the legal sector however and have provided services to legal clients from niche commercial practices to global and magic circle clients. We are proud to say that some of those clients have been clients of Lights-On from within the 1st year of operation.